Just at the edge of St. Louis Missouri sits Lone Elk Park, many people do not even realize it is there. In fact at one time it was at risk of being shut down or sold due to lack of interest and budget cuts. In my opinion it was lack of advertisement, because who wouldn't want to see this? Especially so close to city life, where this is not your everyday view. 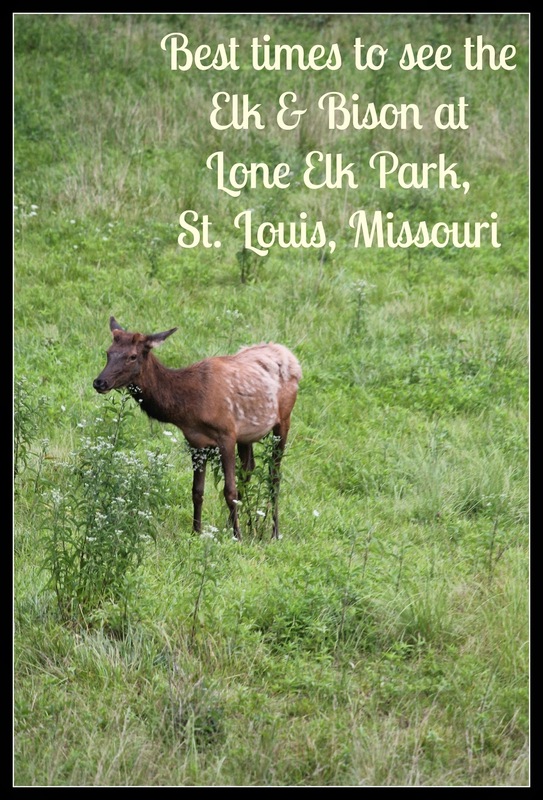 Lone Elk Park has more than a few bull elks - actually it has a lot more inside the park; you will see a herd of Elk, a herd of Bison, they offer fishing, picnicking (not near the Elk or Bison), and there is other wildlife - we saw a family of raccoon, few deer, and even a snake! Not who I want to see digging through my trash, but so cute! Now there is some tricks to seeing all these gorgeous animals at Lone Elk Park - you have to know what time to go. I am not an outdoor expert - I am an outdoor enthusiast, so I learned the hard way! We loaded up around 3 pm and took a drive through Lone Elk Park and saw this! For me that was an amazing, I have never seen an Elk outside of a zoo - so I was tickled pink with this view! However, we wanted to see more. I pulled out my IPhone and Google searched "When is the best time to see the Elk and Bison at Lone Elk Park" - oh how I love technology! Six feeds down a local photographer puts a tip in that you need to go early in the morning or late in the evening. We decided we would drive down the road to the World Bird Sanctuary, see some birds then come back and try again. A few hours later we gave it one more try, as we went around the bend we saw cars slowing down; looked to the left of this we saw THIS! I am pretty sure there was crying in the backseat of my car - we had found the Elk. We spent what seemed to be hours (minutes, but I am impatient) photographing, watching, discussing, and in awe at these beautiful creatures! Most of the Elk seemed rather immune to the fact that we were there - note you are not permitted to get out of your vehicles where the animals roam for safety reasons obviously. We soon noticed we had created a roadblock with our amazement of the Elk, so did many others, but we begin to feel guilty and knew also that if the Elk were stirring this could mean the Bison were to. So we made our through the park to the Bison area - the Elk and Bison are not kept in the same area. We approached a big hill and noticed vehicles parked in all sorts of directions - always a sign that something is going on! As I maneuvered my way through the vehicles we saw this! Of course immediately I began craving rump roast - right? Just kidding! The view was amazing, but who wants to sit and stare at Bison Butts - when you know you can see their heads if you are just a little patient. We noticed the Bison making way to the woods and down the hill, so we drove back around the Bison area and saw this. The Bison slowly making their way to the water, so we sat and waited, and waited, and waited for what to seem forever - since we had three kids in the car. Finally the leader of the heard made way and we caught a glimpse of this. Eventually the whole herd moved down the hill and and we got see them briefly graze in the grass before they crossed the road and disappeared again. The boys being all about the wildlife world reminded me that we had not seen the Elk Bulls (pictured above) with the herd. They were right the first time we saw them they were bedded down, so where were they? Off to the Elk part of the park again and just down the hill from the lake area we saw the Bulls grazing. I assume the Bulls are like most men and keep the ladies at a distance or something! The Elk and Bison are rather large animals, sort of like cows, so they do not like to stir in the heat of the day. The best times to see the Elk and Bison at Lone Elk Park is during feeding times - which is early in the day and later in the evening - we saw the most animals between 6 p.m. and 7 p.m. The park is FREE to visit and is open during day time hours - they do accept donations to help with cost of the animals - I encourage you to visit the park and I also encourage you to remind St. Louis County that this park is very important as it lets us get a glimpse of the wild.